Yesterday was the official start of the Volvo Ocean Race. The "VOR" as is has come to be known, is an around the world ocean race that spans about nine months and is an exceptional test of skill and vigor as these elite sailors cross oceans and sail in the famously difficult higher latitudes of the Southern Ocean (appropriately nicknamed the "roaring" forties and "furious" fifties) in order to pass both the Cape of Good Hope and Cape Horn. It is, quite literally, the equivalent of climbing Mt. Everest in terms of difficulty and skill, and the "adventure" aspect of the event is always certain. Follow along if you like - we will be. 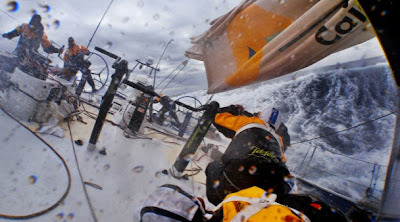 It's not cruising in the Caribbean, but it's hard-core performance sailing at it's very best!